With Spring comes Easter… with Easter comes CADBURY CREME EGGS!!! Oh my god, how I love these things. I decided to “crack” one open to see if I could get the true egg effect… but no such luck. Clearly those product pictures are rigged (but aren’t they all?). I had a fun licking the plate clean though…. so it was worth the effort. 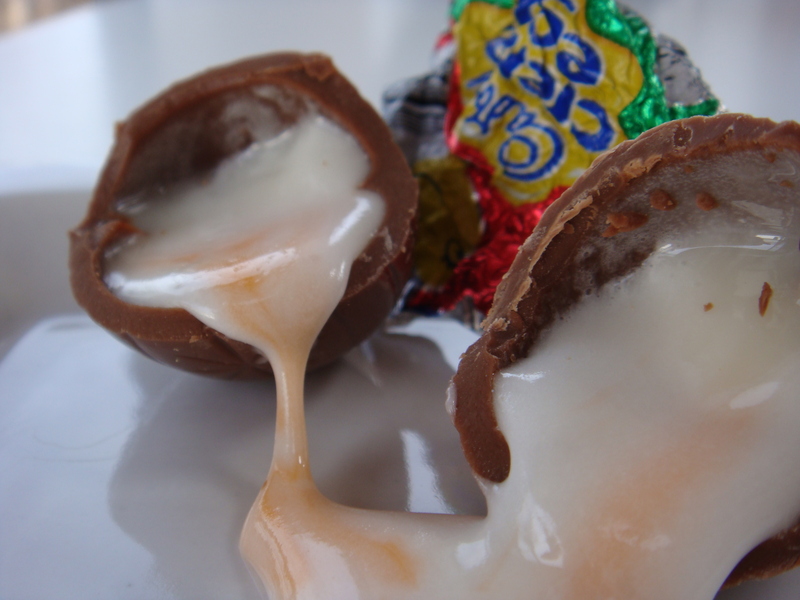 I decided to do a Google Image Searchto see if I could find any better photos — and in the process, found some funny and very interesting Cadbury Creme Egg facts! First of all, there are several new commercials that came out in 2009… they are all hysterical. I couldn’t find the video for this one, but it’s worth it to click on the link. And perhaps the best… the Cadbury Creme Egg McFlurry! Clearly not something you will find in the US… I think I need to plan a trip to the UK. SOON.